This Item’s Selling Price is $300.00. The Balance Due when this item is in stock will be $270.00 Plus Shipping. 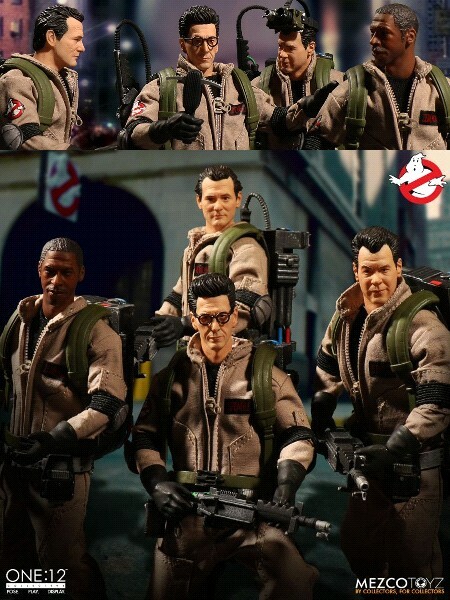 Mezco One 12 Collective Ghostbusters 1/12 Scale Collectible Figure Deluxe Box Set. They ain’t afraid of no ghost !!! Mezco welcomes everyone’s favorite parapsychologists into the One:12 Collective with a five-figure deluxe set - all four Ghostbusters plus a supernatural bonus figure: Slimer. Each Ghostbuster comes with their own light-up proton pack and is packaged in a special edition, collector-friendly metal tin, perfect for displaying alongside the troop! After losing their cushy positions at Colombia University, Peter Venkman and company decide to become "ghostbusters" and wage a high-tech battle with supernatural forces in order to make ends meet. Upon stumbling across a gateway to another dimension, the Ghostbusters must save New York from complete destruction. This Set is Due out in February of 2019.